Jace (Homepage) wrote: It was dark when I woke. This is a ray of susnihne. Giò (Homepage) wrote: Caspita, bellissima, molto molto particolare!!! Guido (Homepage) wrote: Tu hai l'Up, io l'Up and Down. Capito? E' solamente un gioco di parole (pero' segui il link e capirai). Colors Inc (Homepage) wrote: really nice, the perspective is great! tom (Homepage) wrote: Absolutely excellent! Love the dark backdrop. Debbie Hartmann (Homepage) wrote: I love this photo! 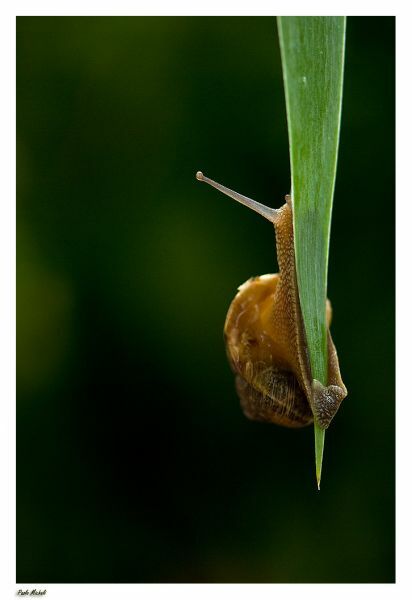 It is a perfectly captured moment in time, and it looks like the snail is hanging on for dear life! Giovanni (Homepage) wrote: eheh, strana ginnastica! bellissima! Alex (Homepage) wrote: Que bien enfilado va este caracol, parece como si de una pruba se tratase, buen disparo. Saludos. f/1.2 (Homepage) wrote: What an amazing shot. A real caputure of a moment in the natural history of our planet. Great stuff. Mike (Homepage) wrote: Goodness! that snail is holding on for dear life! Great catch and wonderfully done shot. TP@Photoskiasi.com (Homepage) wrote: The title says everything. I just hope this poor guy can hold on. Olivier Jules (Homepage) wrote: that's a stunning capture!!! very well done!!! Andrés (Homepage) wrote: VAry cool. What a great climber!! Arjan - PlasticDaisy (Homepage) wrote: Now that is just an amazing find! Hold on for dear life! :) It contrasts so nice against the dark background! Brings out even more details. Nice! Susan (Homepage) wrote: Wonderful macro with lovely bokeh. Marcie (Homepage) wrote: Exceptional..and exquisite detail. WOW! John Maslowski (Homepage) wrote: Just hanging around. Fascinating macro. Love this shot, perfect capture with superb sharpness. Joaquin (Homepage) wrote: Fantastic moment! Arnd (Homepage) wrote: Love the composition and lighting. This is a really good shot! Simone (Homepage) wrote: Una situazione insolita...proprio bella! Andy (Homepage) wrote: Wow Paolo what a find! Amazing macro!! beanow (Homepage) wrote: Paolo! Fantastic capture! Perfect done! grant (Homepage) wrote: remarkable photo - first rate! Terry H. (Homepage) wrote: Great close up! I really like the angle of the shot so you can see how it grips the plant. Very Cool!